A year and a half ago, I got an offer to leave my dream position as EVP and General Counsel with the Interactive Advertising Bureau to join a tiny start-up with no members, almost no revenue, a staff of one, and an operating plan that looked like a blank piece of paper. Why did I agree? Because that new organization - the Trustworthy Accountability Group - had a singular mission that inspired my passion: to lead the fight against the criminals who were corrupting the digital advertising industry by stealing money, infecting consumers’ computers, and distributing pirated content. Could we convince our sprawling industry to come together in a common effort to fight ad fraud and related crimes like piracy and malware? Would intense competitors be willing to share proprietary information and tools to combat those problems with one another? Could we create an effective set of interlocking seal programs to establish best practices for industry leaders and good actors? Was it possible to shine a bright light of transparency into the dark and tangled maze of digital ad payments? Would ad buyers commit to requiring their downstream partners to obtain TAG seals and adopt those high standards? Happily, after an amazing year of industry collaboration, program growth, and market deployment, we have the answer to those questions, and it is a resounding YES. As we enter 2017, I’d like to share a few of TAG’s successes from the last year as we have grown from start-up to a mature and rapidly expanding organization, along with a couple of thoughts about the year ahead. Of the four central priorities for TAG, none has seen more progress in 2016 than our fight against fraud, which grew from the seeds of a conceptual framework to a fully deployed and broadly supported seal program. When we started the year, the TAG Certified Against Fraud Program had only been described in its broadest terms. Within months, however, our anti-fraud working group had finalized and launched a concrete program to the market with the committed support of more than 30 of the industry’s largest players. As you probably saw, that announcement received broad press coverage, with positive articles highlighting the launch in Advertising Age, AdExchanger, MediaPost, Marketing Land, Marketing Dive, Business Insider, FierceCMO, AdNews, Naked Security, Associations Now, CableFax, CMSWire, and IDG News. Later in the summer, we announced the first 100 companies to be approved for the TAG Registry, our gateway screening process which verifies companies as legitimate participants in digital advertising and awards them a unique TAG-ID to share with their partners and append to ad inventory (as highlighted in MediaPost and Business Insider). In December, the TAG Certified Against Fraud Seal went live to the market with the announcement of the initial group of companies to receive this important certification. Those initial recipients were noted for their leadership in articles in Advertising Age, MediaPost, and Marketing Land, while dozens of additional companies are in the approval pipeline for announcement in early 2017. Highlighting TAG’s central role as an information-sharing resource in the fight against fraud, we closed out the year by working with a TAG-participating company, White Ops, to expose the massive Methbot fraud operation. While we waited for Federal law enforcement to finish collecting intelligence for their investigation, we were able to rally together more than 170 anti-fraud executives from TAG participating companies and within 24 hours the broader industry was mobilized to combat the biggest fraud threat it has discovered to date. This past year also marked a turning point in our industry’s hard-fought campaign against ad-supported piracy. 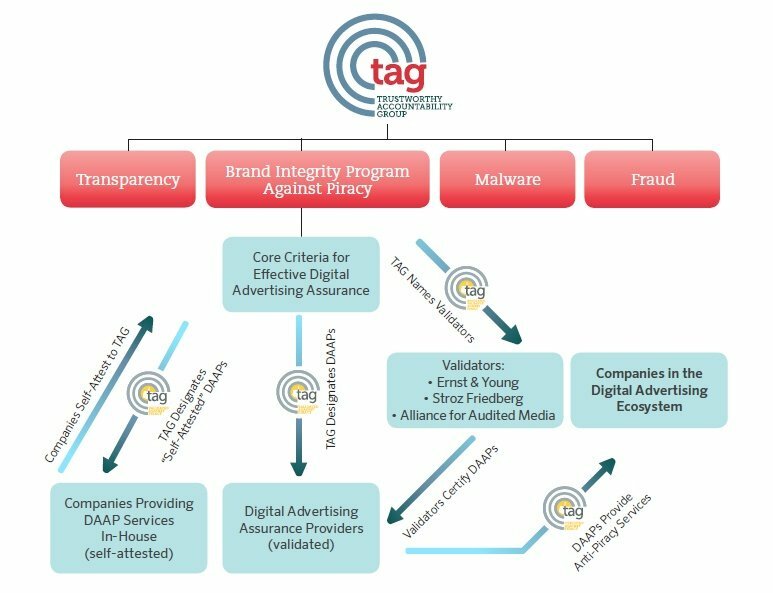 When we started 2016, no companies had yet completed TAG’s third-party validation process to become Digital Advertising Assurance Providers (DAAPs) for anti-piracy services. By mid-year, however, eight companies had become validated DAAPs while another four had self-attested to compliance with one or more of the program’s principles. All of those companies are now in market providing TAG-approved anti-piracy services. The success of our industry’s anti-piracy efforts depends on the commitment of advertisers and agencies to work with the providers of those services, however, which is why we were so pleased to continue to build the list of companies that have taken the TAG pledge to work with those companies, among other steps against piracy. In June we announced a unified front of the four largest ad agency holding companies that had committed to that pledge, along with a growing list of major brands, an announcement covered by Adweek and Marketing Dive, among others. As we entered 2016, malware was perhaps our least developed program area. By the end of the year, it stands as a robust and fully developed seal program. To help establish the framework for our malware efforts, TAG held our first Malware Summit in New York City in June, bringing together a small group of industry leaders to discuss the best approaches to fighting malware in digital advertising. TAG’s Malware Summit also allowed us to continue our dialogue with representatives from the U.S. Department of Homeland Security, FBI, and Department of Justice, an effort covered by Advertising Age. In October, we released a foundational piece of our malware seal program with TAG’s Best Practices for Scanning Creative for Malware, a white paper on steps companies should take to block the distribution of malware through the channels they manage. Finally, in a culmination of our anti-malware efforts, we launched the TAG “Certified Against Malware” Program, our fourth and final seal program, in November. As part of that program, we announced a first-of-its-kind Malware Threat Sharing Hub to disseminate near real-time intelligence on malware attacks to other companies and law enforcement agencies. Coverage of that announcement and the companies agreeing to take part included stories in Advertising Age, MediaPost, Politico, and IDG News. Last, but not least, in 2016 we took significant steps to build and strengthen the level of transparency throughout the digital supply chain. TAG’s Payment ID System enables companies to ensure that payments made in the digital ad ecosystem are going to legitimate companies. The Payment ID Protocol, codified in the newest version of the OpenRTB standard, creates transparency by linking identifiers for the partners from whom a company buys ad inventory and those buying from that company to that inventory, effectively “following the money” across the entire digital advertising supply chain in order to prevent criminals from receiving ad spend. The Inventory Quality Guidelines (IQG), TAG’s program to improve transparency in the digital advertising ecosystem through a set of common disclosures made mostly by publishers and platforms about the quality of their inventory, announced more than 20 leading companies who had achieved IQG compliance, including four companies reaching “Tier One” status by using an external auditor to review that compliance, an announcement covered in a MediaPost exclusive. In a blog post at the beginning of last year, I said 2016 would be a year in which we moved from design to execution, and clearly it was. All four of our seal programs are now finalized, with growing numbers of prominent companies awarded TAG seals. Now it’s time for us to move to our next phase: expansion. In 2017, we plan to expand our seal programs and make TAG participation the sine qua non of doing business in the digital advertising ecosystem. We plan to expand our reach to effectively cover the mobile platforms that are beginning to dominate consumer time and digital ad spend (and soon criminal activity). We plan to grow the TAG ID System and Payment ID Protocol, so advertisers know who they are doing business with and can effectively track the money they spend on every ad throughout the supply chain. And we plan to increase our collaboration with law enforcement, so they can catch and prosecute the criminals who are undermining our industry. We also plan to measure the effectiveness of our programs in 2017, so we can track our progress against the challenging goals we have set. That measurement process will also help us adjust and improve our programs to better address the rapidly evolving threats in our space. All of these ambitious goals in 2017 depend on one thing: you. Your company’s participation and leadership in TAG’s programs is what drove our accomplishments in 2016, and your continued engagement and support will determine whether we are successful in moving the needle against the threats we face as we move ahead. I want to thank each of you for everything you have done, and I look forward to even greater achievements in the year ahead.